The culinary scene in Ottawa is alive and thriving. The fine dining rules of yesteryear have been pushed out with a crop of new chefs and restaurants paying homage to family traditions, world travels and comfort foods. From small plates to sharing plates, tapas to tenderloin, the influences are wide ranging. Have a craving for Ethiopian, Middle Eastern, Asian to Polynesian cuisine? Perhaps you want to see what passes for “Canadian” in the Nation’s Capital? No matter what your heart (or belly) desires, the varied and vibrant foodie scene offers something for everyone, on any budget. With so many new and hidden gems in and around Ottawa, where does a newcomer or visitor start? Martin Elder and the Elder Homes Sales team offer these suggestions. Anne DesBrisay is an award-winning author and culinary judge. For more than 20 years, she was the Ottawa Citizen’s food critic – which allowed her to experience, first-hand, the changing landscape of Ottawas’ culinary, hospitality and food industry. In recent years, Anne has written Capital Dining, a Guide to the Best Restaurants in the National Capital Region. Her coverage showcases restaurants in particular, along with more broad topics of interest in the food and travel industry. Anne contributes regularly to Ottawa Magazine, Taste & Travel Magazine, Harry Magazine and has written about Ottawa’s “power restaurants” for Macleans Magazine, and its Valley restaurants for CBC Radio. 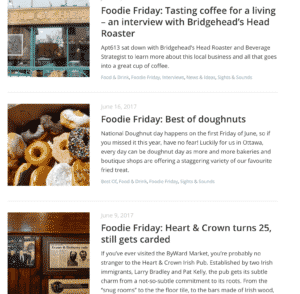 Anne blogs regularly and her Restaurant Reviews section is sure to help cautious eaters discover the best of the best in the capital region. Apt613 is a volunteer-run, not-for-profit organization. The website is home to an award-winning blog totally dedicated to Ottawa’s rich arts and culture. Every one of the contributors and photographers expend their own time and talents (read: for free) to spread the word about what our great city has to offer. Which is why you can expect raw honesty when it comes to their Foodie Friday posts and their regular Restaurant Reviews. Ottawa Foodies is home to an ever-growing community of enthusiasts. Contributors love sharing their knowledge of Ottawa restaurants, shops, and foods. 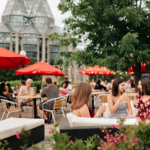 Considered one of the most comprehensive and accurate restaurant listing and review sites in the region, there is nothing in the Ottawa food scene this group won’t uncover! Oh yes, and photos of food galore!! Team Elder Home Sales loves Ottawa Magazine! Reaching one of the most affluent and discerning readerships in the country,Ottawa Magazine consistently delivers high-calibre and in-depth profiles of people, places and the arts. Their superb food and drink coverage will have you salivating and eager to visit the featured restaurants, cocktail lounges, breweries and bars.